Planting bulbs in fall should be a fun project, but if you deal with squirrels who dig them back up as soon as you go inside, it can be incredibly frustrating. With an ounce of prevention, squirrels and bulbs can coexist peacefully in the garden. Here are five ways to outsmart them when planting this fall. We all need to eat, but it would be nicer if our neighborhood squirrels ate our weeds rather than our precious tulips and crocuses that promise to deliver spring each year. Rather than getting mad, work to outsmart those bushy tailed rodents instead. Let's get started. If you absolutely cannot live without tulips and crocuses, consider interplanting them with bulbs from the do-not-eat list above. In my garden, I dig a wide, round hole and set daffodil bulbs around the entire perimeter, plus a few more inside the circle. Then I set tulip bulbs inside the circle of daffodils, which I hope will act as camouflage. Most years, it works like a charm. As an added bonus, since the tulips and daffodils bloom in succession, there's something in bloom in that spot for a longer period than if I had planted all of one kind. Especially when planting tulips and crocuses, but as a precaution when planting any kind of bulb, use an animal repellent to deter squirrels, chipmunks and other bulb thieves. I like to use Plantskydd animal repellent since I'm an organic gardener and this product is OMRI certified organic. It works like a charm for me every year. I sprinkle a bit of the granular formula in the hole with the bulbs and again on the surface of the soil once I cover them up. If you need extra protection in your garden, lay your bulbs out on newspaper and spray them with the liquid formula of Plantskydd before planting. Let the product dry on the bulbs before planting to make sure it sticks. 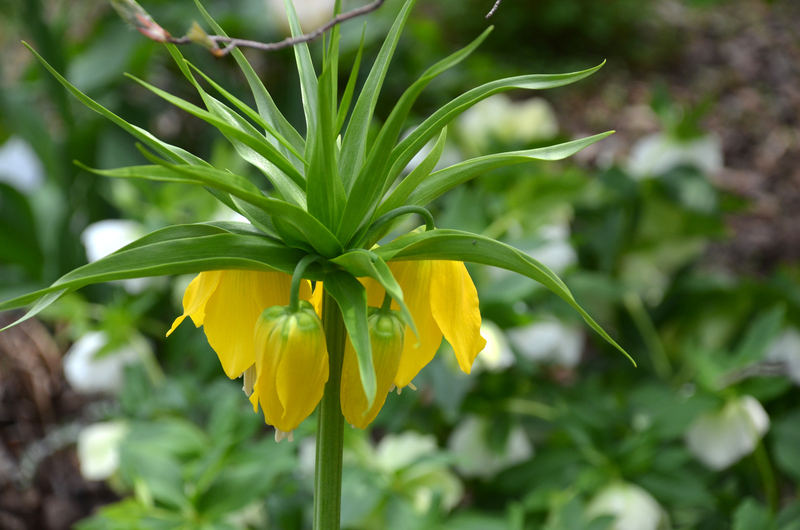 Deter squirrels by planting bulbs they don't prefer like Fritillaria lutea (Yellow Crown Imperial). Photo courtesy of Susan Martin. Squirrels are robbers by nature. When they sense the soil has been disturbed, they suspect another animal may have recently stored acorns or nuts there so they move in to steal the loot. They find our bulbs instead, and may dig them up even if they don't find them particularly tasty. Cover your tracks after planting by tamping down the soil firmly, then scatter shredded leaves over the disturbed soil. Clean up any bulb debris including the papery sheaths, as animals can detect their scent. You don't want to give away your "secret" planting spot. If you've tried #1-4 above and you still have animals stealing the bulk of your bulbs, it's time to take more drastic measures. It's a bit more time consuming, but might be worth it to you. Let's talk chicken wire: it's relatively inexpensive, easy to find at hardware stores, and can be reused for several years. 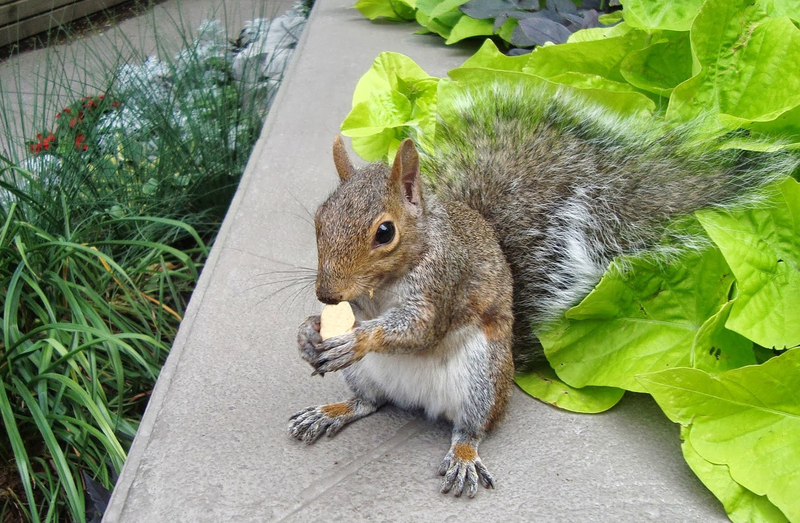 Wait until late fall to plant your bulbs, as squirrels are slowing down on foraging by that time. Follow step #3 above using animal repellent, then lay chicken wire down on the soil surface after planting. Weigh it down with rocks or landscape pins, then cover it with shredded leaves. When a squirrel goes to dig and hits the physical barrier, they typically will move on to easier targets. If you continue to have issues, make a box or sack out of chicken wire, place your bulbs in it, and bury the entire thing in the ground keeping in mind the planting depth requirements for the bulbs. Still no luck? Enjoy your friends' bulb pictures on Facebook!